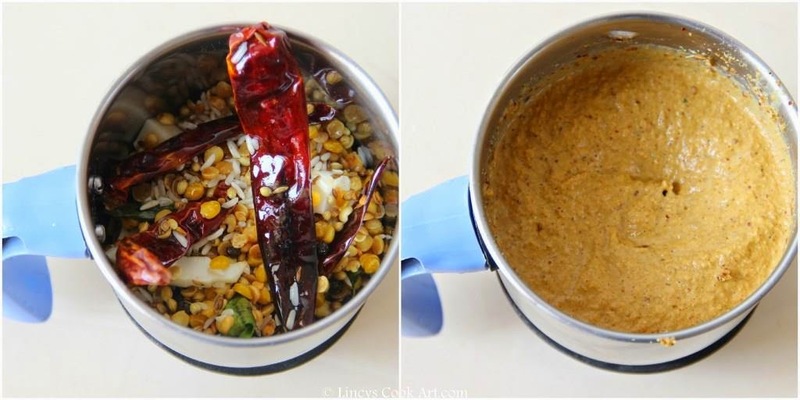 This is an easy to make tiffin sambar which does not require any pressure cooking process. I hate cleaning the pressure cooker after making the sambar. Soaking and cleaning the cooker lid is a tedious process. Pressure cooking the dhal and waiting to release the steam is really time consuming. This sambar is easy to make tasty sambar which saves time and goes well with all types of idli, dosa and pongal. 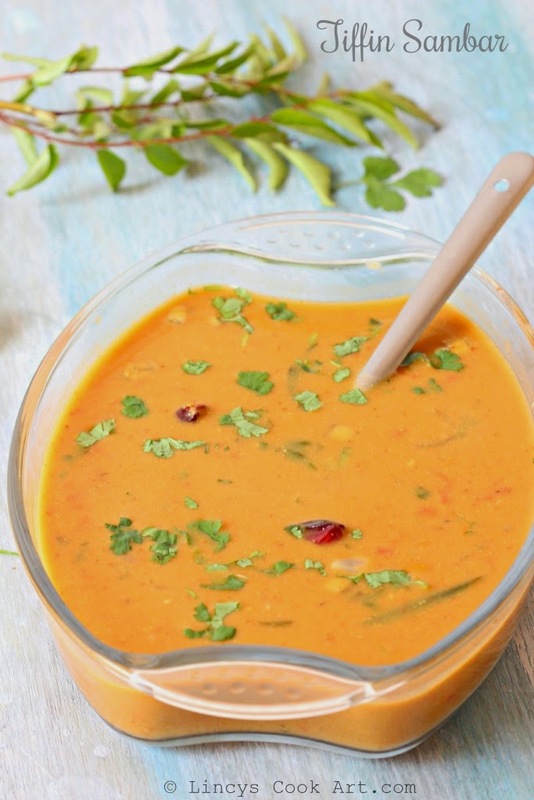 As the masalas are freshly grounded you could feel the freshness of taste and flavour in this sambar. You could have this sambar with plain rice too but it goes well with tiffin items as it has fine texture. Tasty breakfast sambar in minutes a perfect comfort food!!! For the sambar masala heat half a teaspoon of oil and add the ingredients one by one mentioned under the masla powder. Allow the mixture to cool and pulse the ingredients to powder and then add some water to grind this as a fine paste (very fine paste is not necessary); set aside. Soak the tamarind and extract the juices. 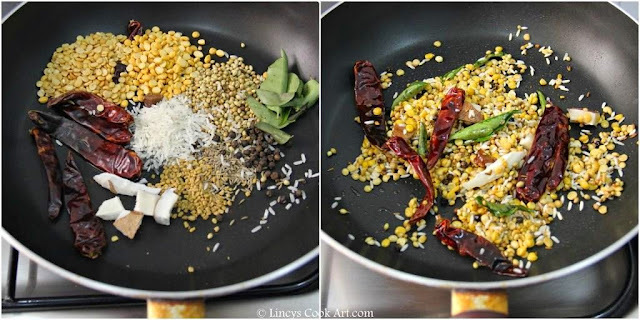 Heat oil in a pan and add the mustard seeds and jeera. Once it crackles add the dry red chilli and curry leaves. Add the chopped onion in that oil and cook till it turns translucent. Now add the chopped tomatoes and cook till soft. Add the cubed carrot and brinjal with some salt and cook for about a minute or two till the vegetables half cooked. Now add the tamarind extract and allow to boil for fifteen seconds. Pour this masala slurry on to the pan and add some more water (around 2-3 more cups) turmeric and jaggery. Close with a lid and allow this mixture to boil, cook and thicken for about 10-15 minutes. Add some chopped coriander leaves and switch off the gas. Serve hot with any type of Idli, Dosa or pongal. Must be a very fragrant sambar. Nice pics.